Latest Plants available: I would love to hear from you. Call or contact me at bonsaiherb@gmail.com. or follow me if you have a Google account on my blog. Or leave me a “private message” in the contact form at the bottom of the page. 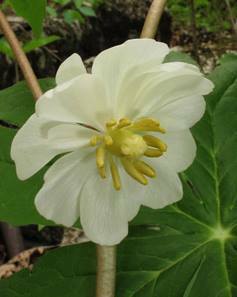 Podophyllum peltatum is one of the truly great eastern US spring woodland ephemerals. 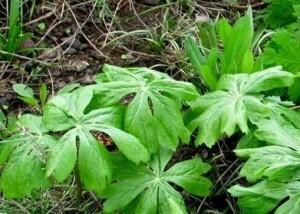 Emerging in early spring, the large, twin, umbrella-like leaves are showy and conspicuous.the green “umbrella” pushes out of the ground and when the plant has reaced its 1=1/2 ft height the leaves expand like a flat, open-sectioned green parasol The nodding, white to rose-colored flowers have 6-9 waxy white petals, with many stamens. The fruit if you are lucky is a large, fleshy, lemon-shaped berry. The plant colonizes by rhizomes, forming dense mats in damp, open woods. Podophyllum peltatum is stoloniferous and, in time, can form very large colonies so don’t plant it near choice gems that will be swallowed.The name refers to the May blooming of its apple-blossom-like flower. The leaves, roots, and seeds are poisonous if ingested in large quantities but the roots were used as a cathartic by Native Americans and the edible ripe, golden-yellow fruits can be used in jellies. The common name Mandrake rightly belongs to an unrelated Old World plant with a similar root. One gallon cans at the moment for $8.95. Hardy to Zn 3. [wpepsc name=”Podophyllum peltatum” price=”8.95″] Not available for shipment until fall! The family podophylum has some interesting cultivars and species. Mine is the common form but a friend just bought this variegated cultivar. 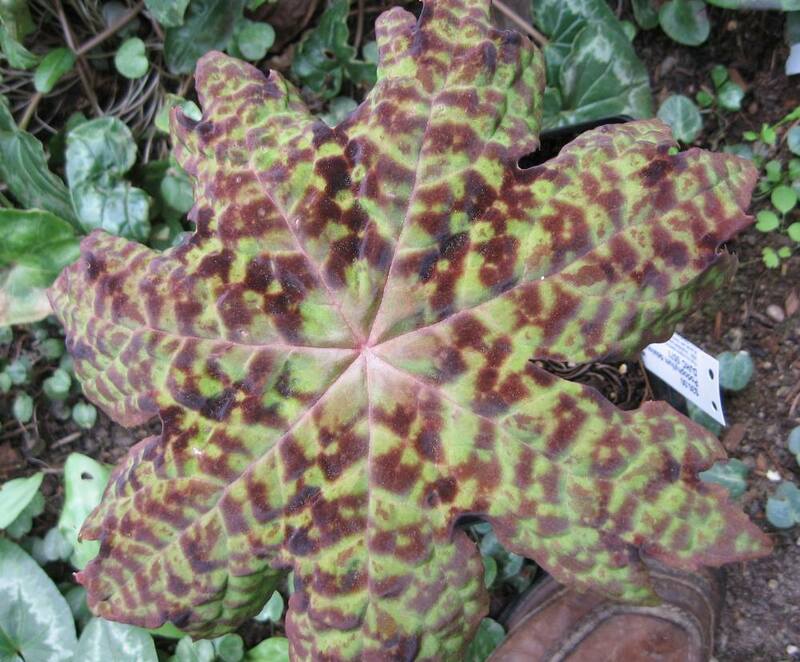 They come in a kaleidoscope of leaf colorations. Pricey mind you! Penstemon pinifolius ‘Mersea Yellow’ is not exactly what I wanted but it looks interesting. The regular P. pinifolius compacta is a lovely red available from High Country Gardens.. 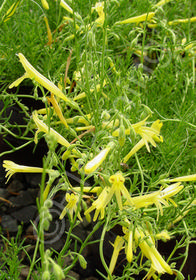 Depending upon the cultivar Small, bright yellow or RED, tubular flowers bloom from this hardy native cultivar from summer through fall. Excellent in rock gardens and gravelly soil.